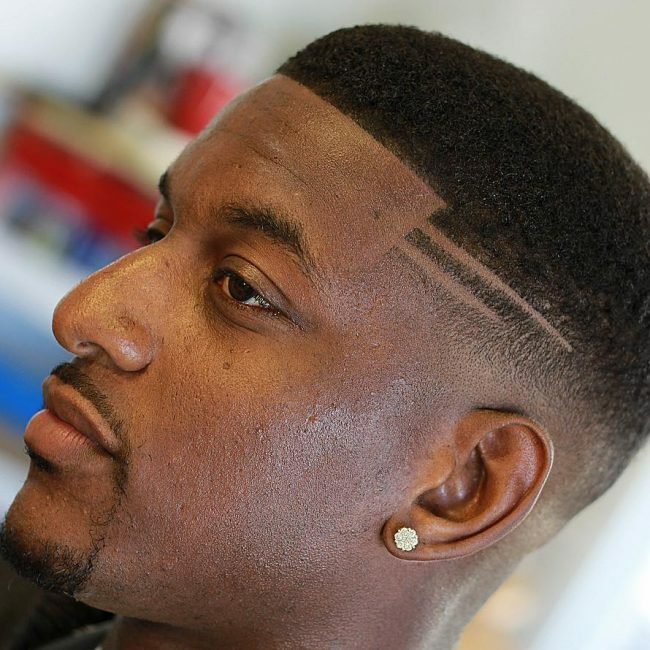 Fade haircuts for black men don’t only look impressive but highly stylish as well. They are done in various ways and even with blade designs, to give it a look like never before. 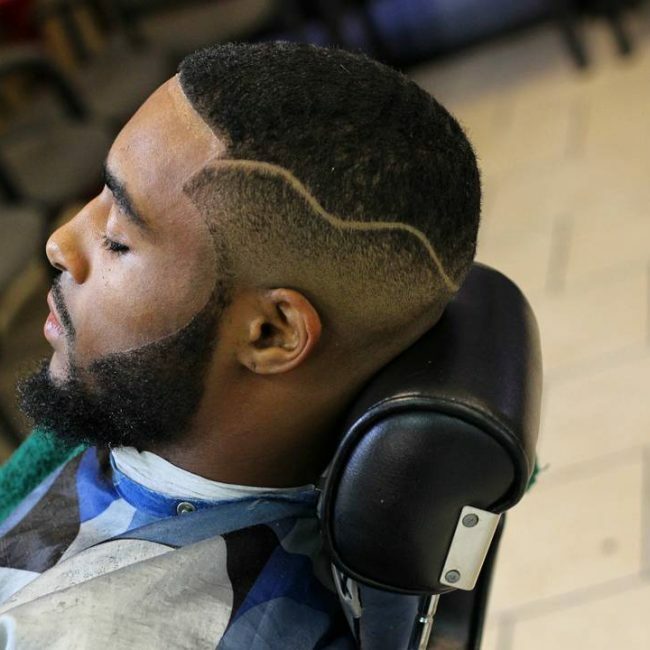 Barbers all around the world are using fading techniques to give the best haircut possible. 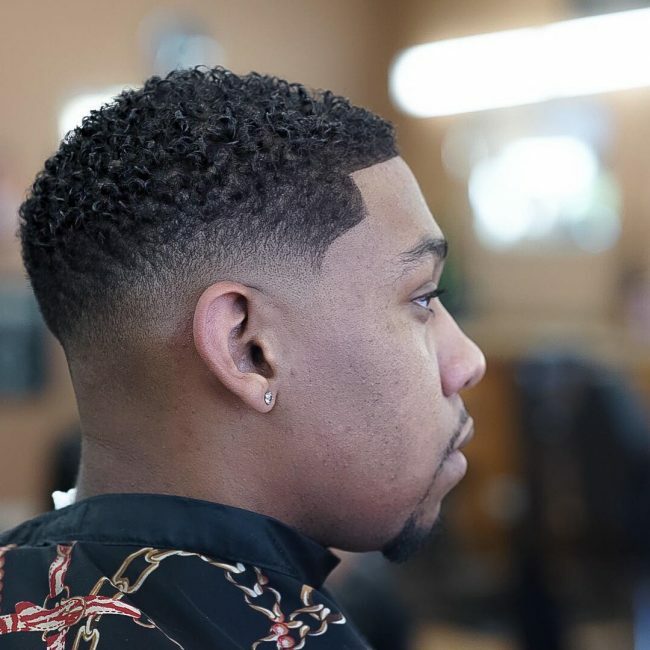 The magical work of blade 1 and 2 of a clipper is evident on the sides and back while the top hair is brought up with help of a gel to give is a perfect look. 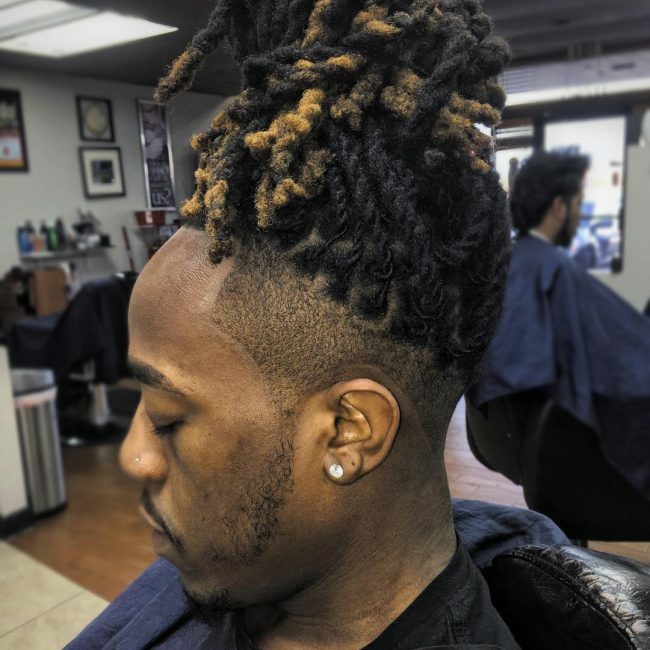 The entire head is cut to the same but wavy length with the sides and back kept faded with skin being visible. 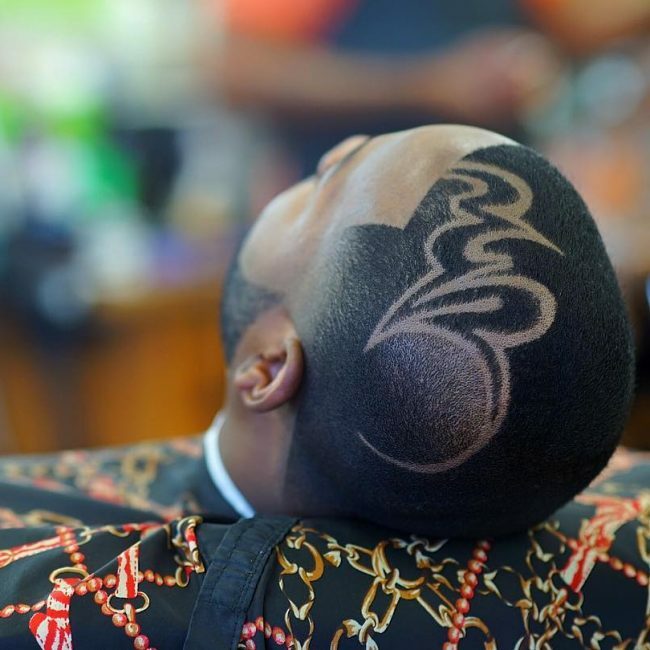 Shows the elegance of the barber. 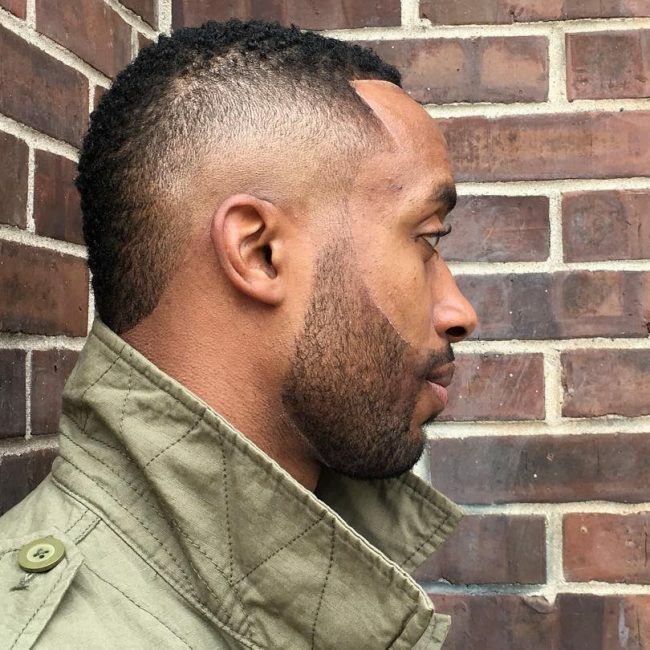 The sides of the head are left faded with blade 1 of clipper but the back is left with same hair length as the top. 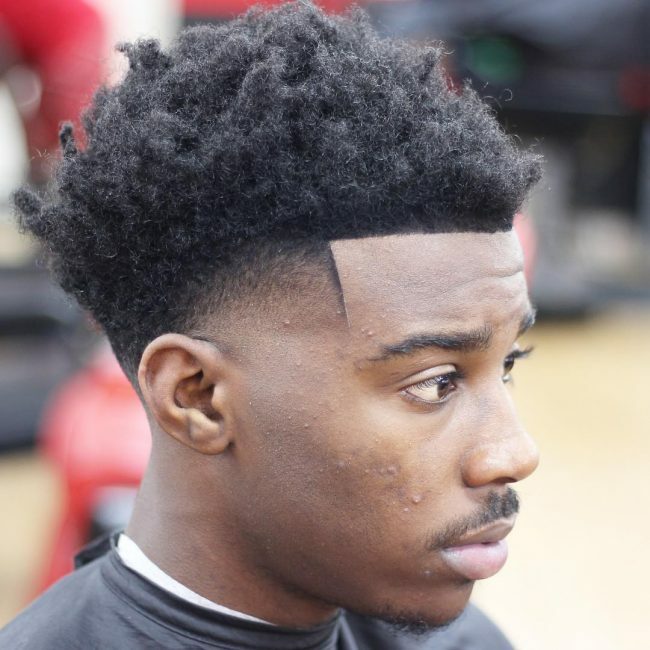 This is extremely unique and excellent cut. The sides and the back of the head, right till the border of the top of the head, are cut to basic skin length and a unique design is made on it with a blade. The top has golden curly volume. 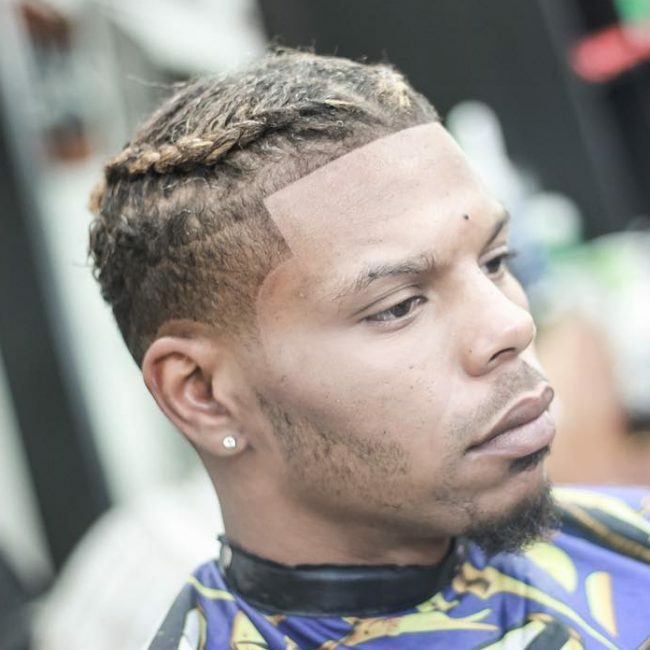 The extensions are tied on the top of the head with the sides and back made faded with a trimmer. 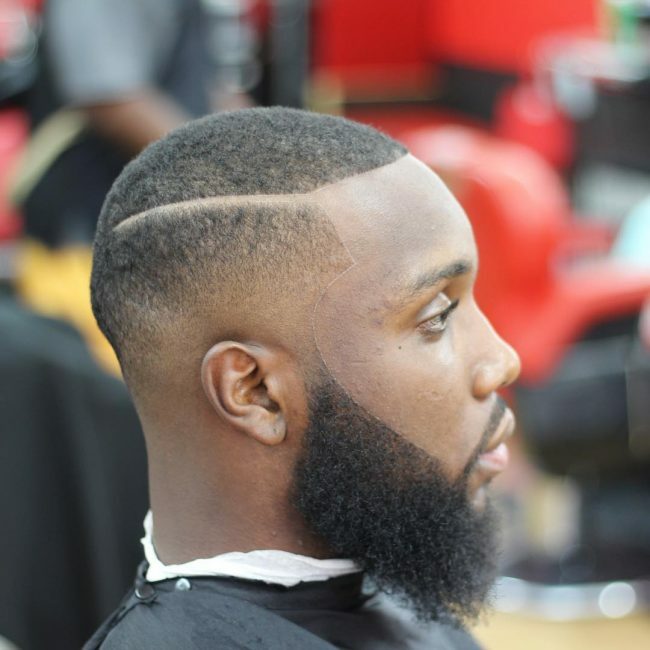 The top of the head till the borders is cut in a round shape with the sides and back are drop faded the shortest length possible. 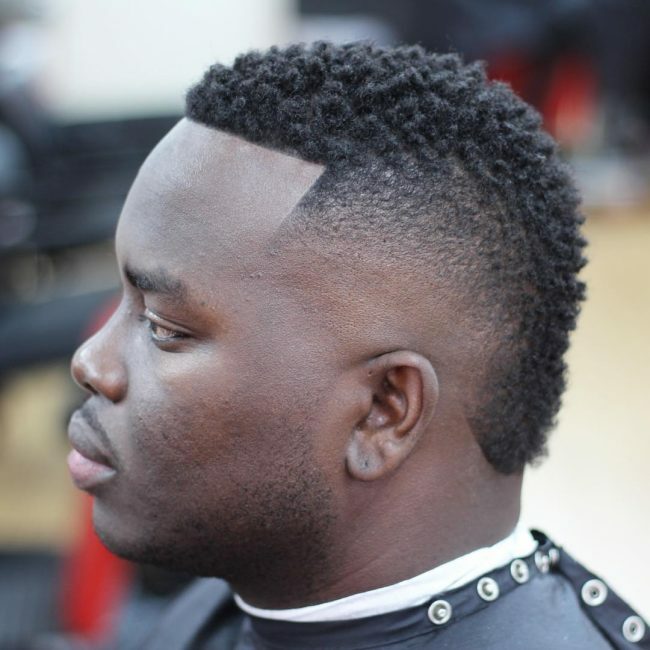 The blade is used to make the side haircut line and the borders of the entire haircut. The top is of the same length throughout with the sides and back kept faded. 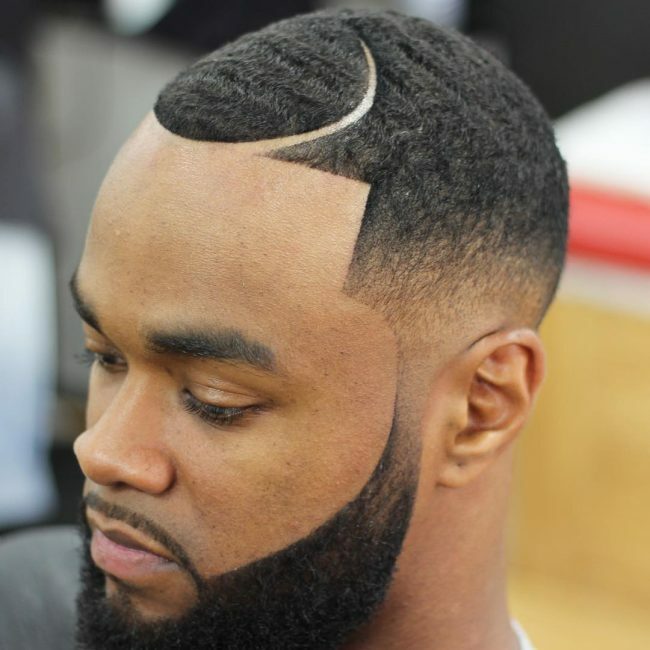 This cut demands the barber to use the same blade clipper for the entire head with only the sides that are joining the whiskers to be kept faded. 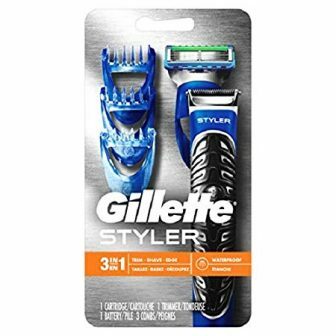 The top has an exclusive design made with the blade. 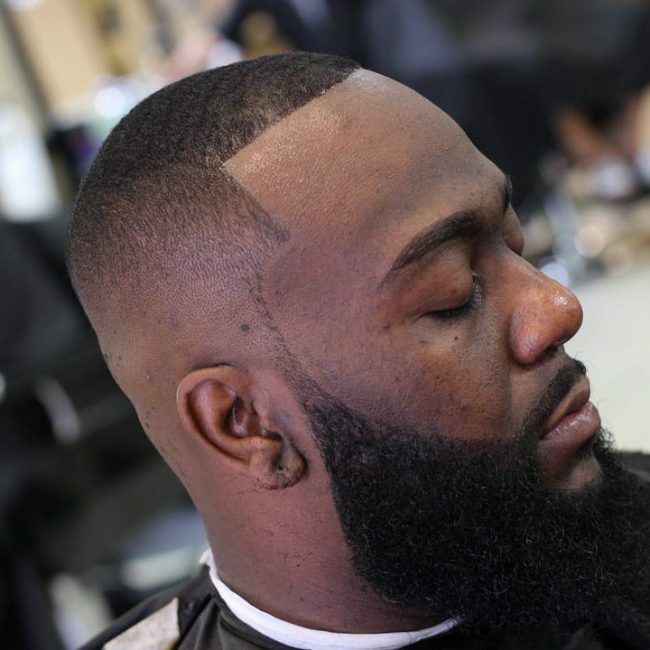 The top of the head till the borders is cut with the same trimmer blade to one length while the sides and back are cut to skin length. 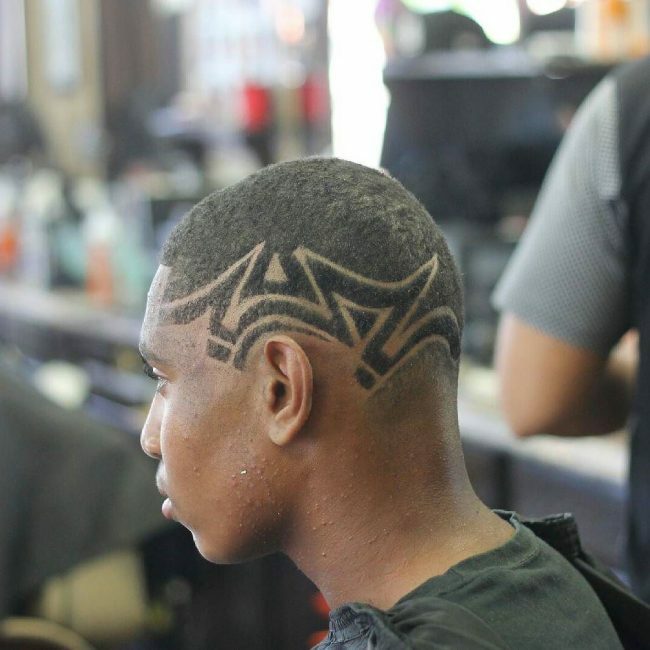 A zigzag design is made with the blade on the sides. 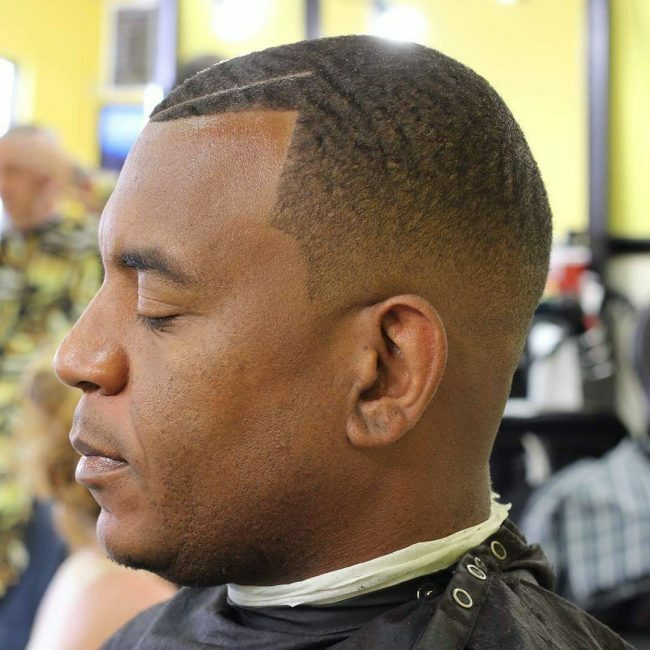 The borders of the top of the head are cut with appealing blade work. The separated top part is cut to small length with no skin visible the sides and back are kept faded with skin evident. 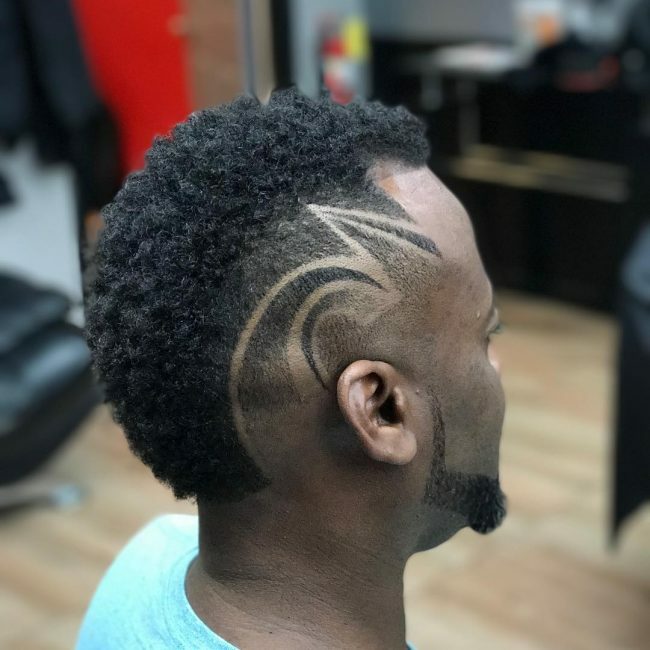 The center of the head till the end of the back are left to small curly length but the sides are cut short with a trimmer with a bombastic blade design on the side. 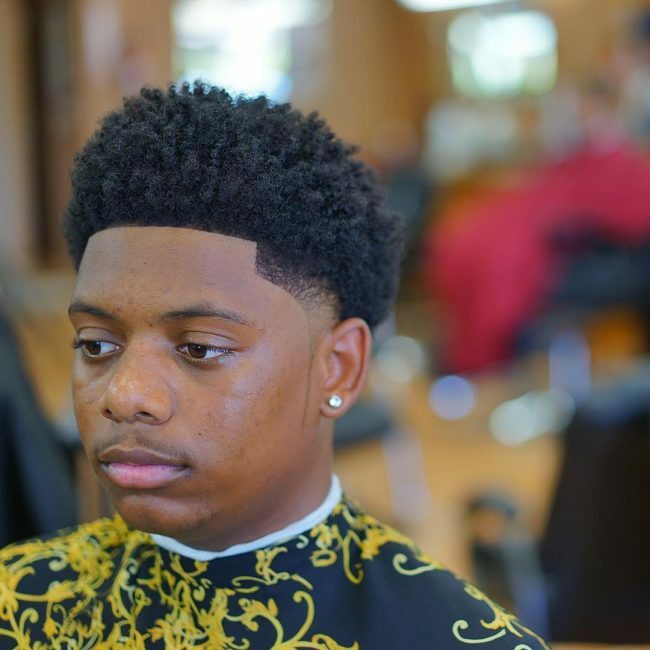 The front of the top of the head has a thick layer of hair while the rest are cut down to two different lengths with the sides staying faded. 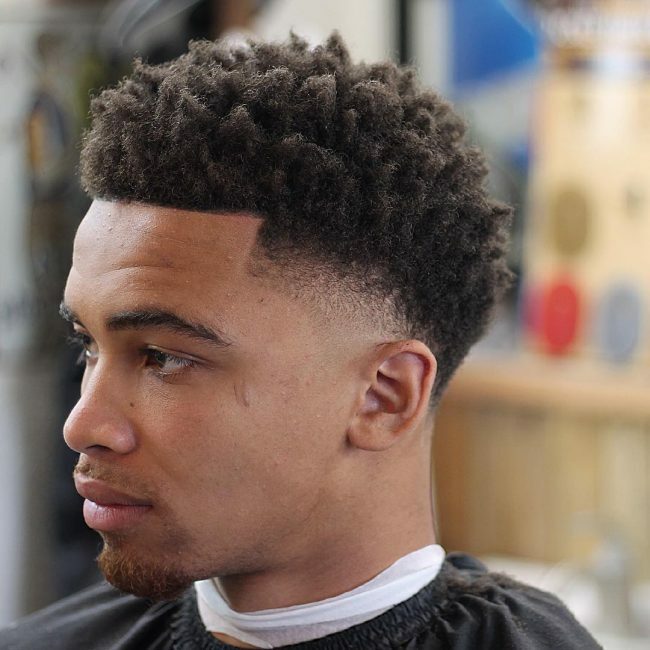 This classic Afro-American bushy haircut has all the curly hair towered up in spikes fashion while the sides have faded clipper design. 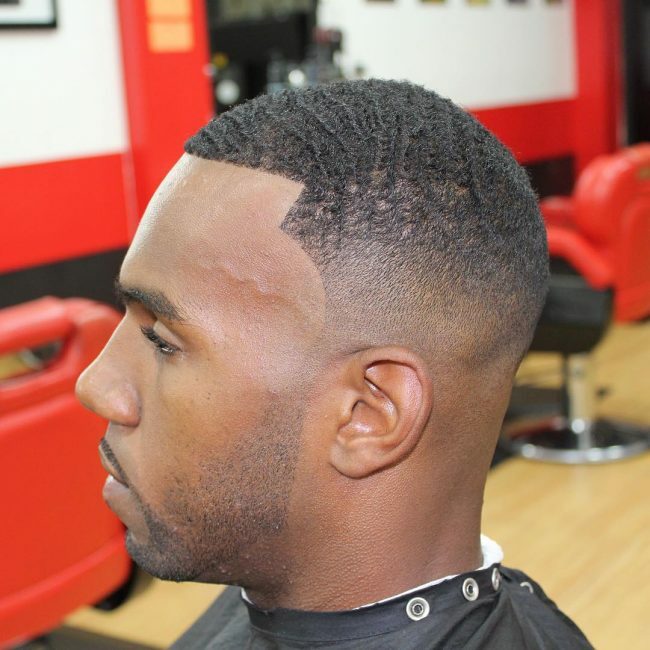 The top of the head is trimmed to the smallest of small lengths while the sides are faded. 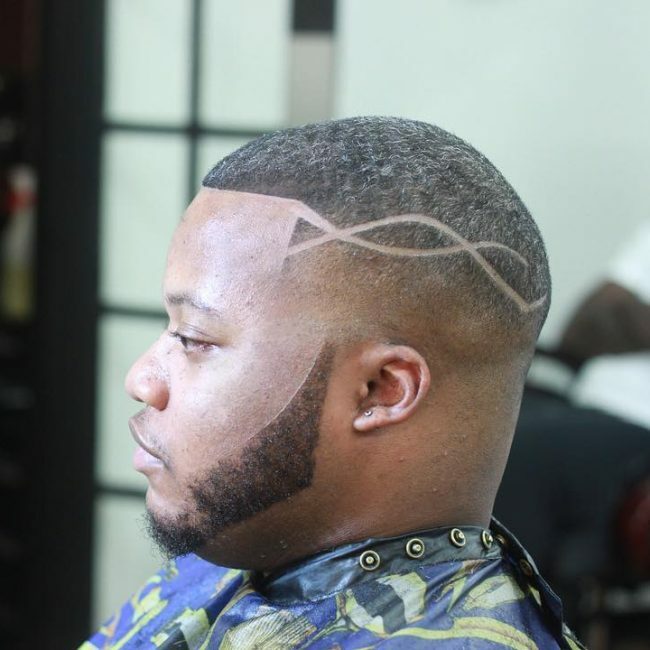 The side haircut line is made with a blade. The top and sides are bordered with a blade and sides are kept as thin as possible. They go in line with the whiskers and beard. 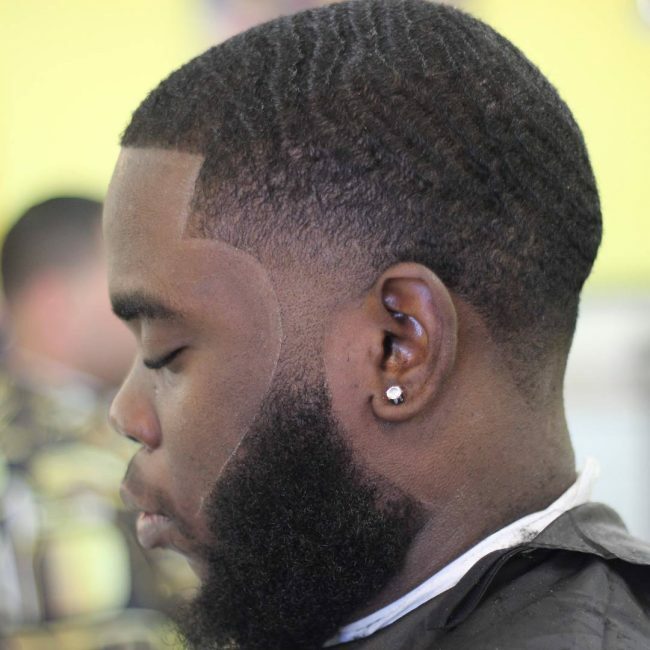 The rounds on the top of the head are trimmed short while the sides are made to skin length with no slope on either side. 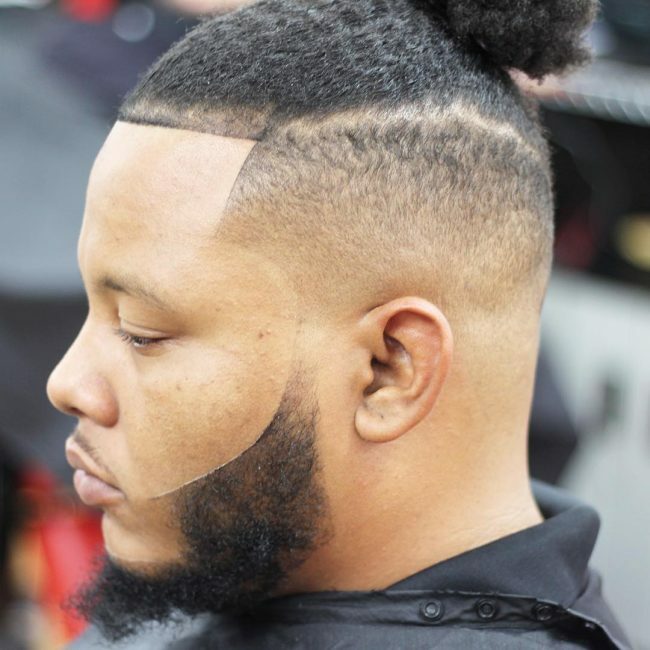 This super combo of a top knot with the sides and back faded with top notch clipper work. No slope on the sides. 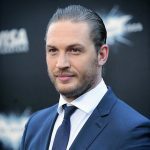 The chunk of hair in a nested style is left on the top of the head while the lower sides and lower back of the head are shaved to the minimum length. 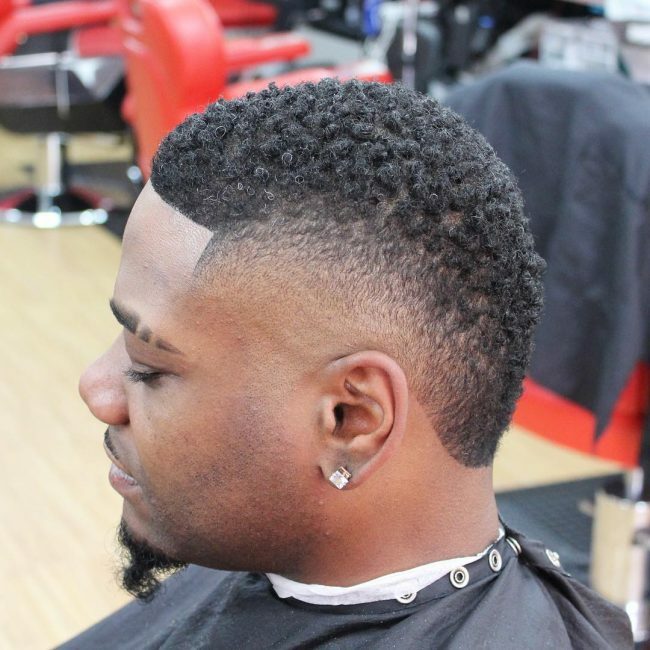 The top of the head is impressively cut and goes on to join the back and sides in a faded look. There is a semi-circle made with a blade on the center. 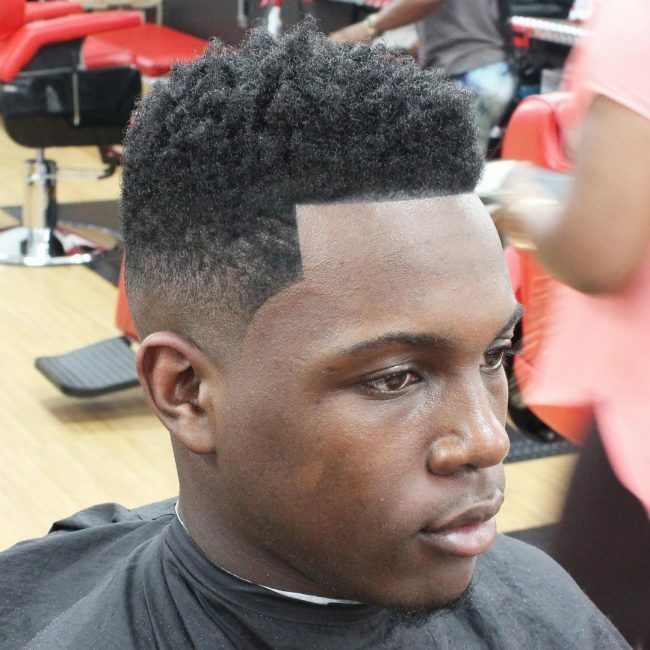 The old-school haircut has put the entire haircut in a block style with the sides shaved to a bare minimum. The top of the head as all the hair in firework style while the bottom sides and back ate trimmed to the shortest length. 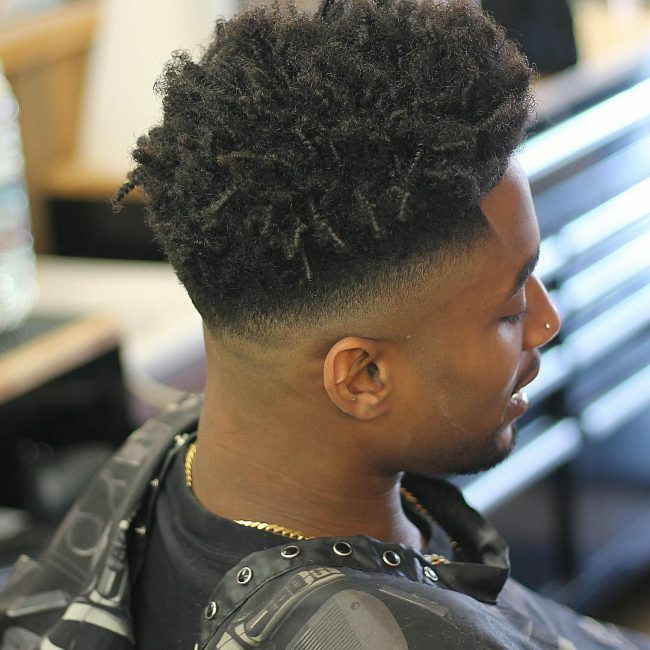 This classy haircut has the curls rolled up with a blade worked haircut sideline. 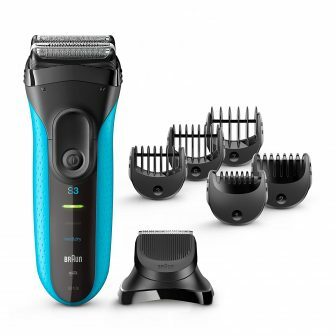 Half of the sides and back are cut using a clipper. 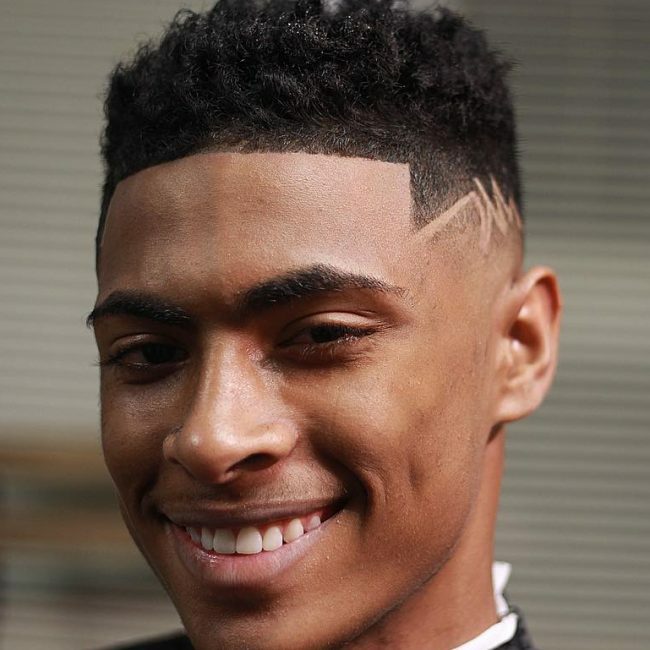 This smooth look has brought all the top hair, the sides and the back to one thick layer. Parts of the sides and back are faded. 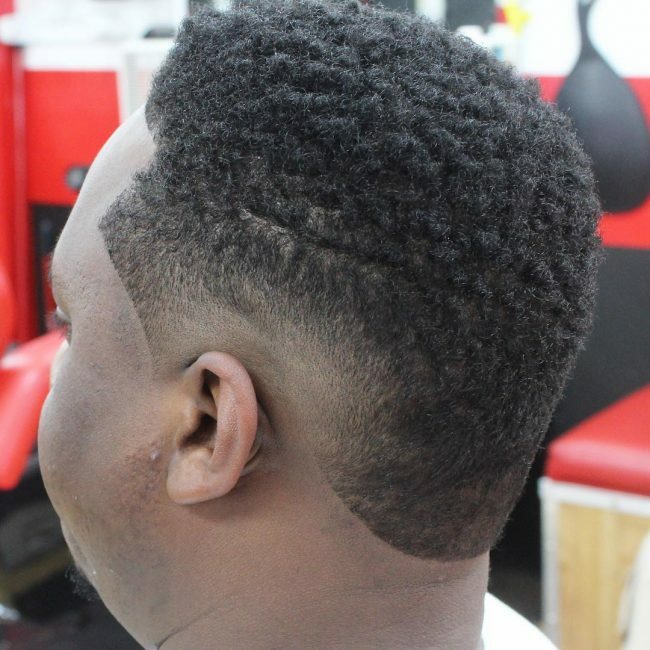 The blade artistry shown on the sides and back is as per the demand of the customer while the top is left with towered curls. 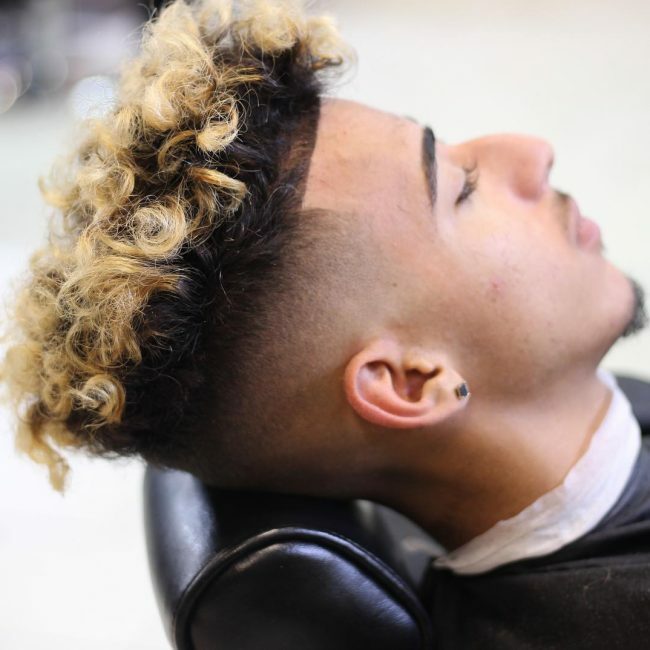 The curls are rolled up in a spiked style while the sides are faded than the back of the head. The bordered are designed with a blade. Here the lines blade work on the side separates the top of the head with the lower faded part. The top has all the hair chunk. The sides of the head are skilfully faded. 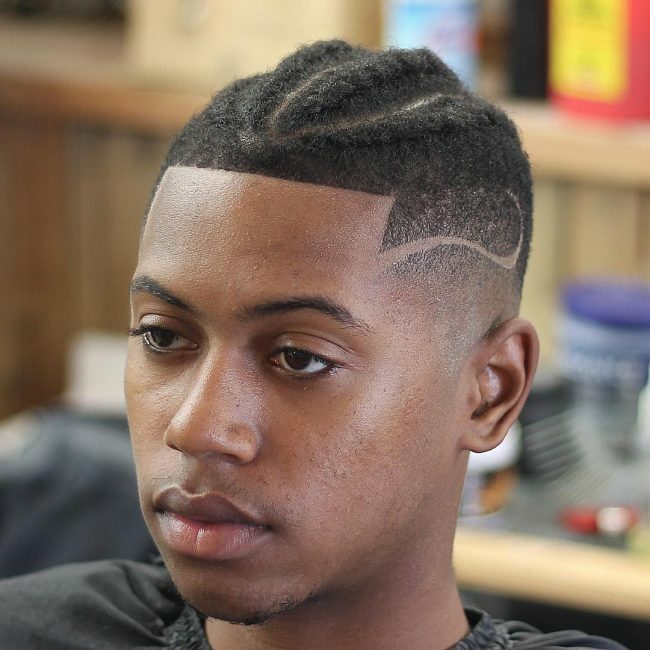 The back and temples are skin faded and the front is shaped up. The top is finger curled. 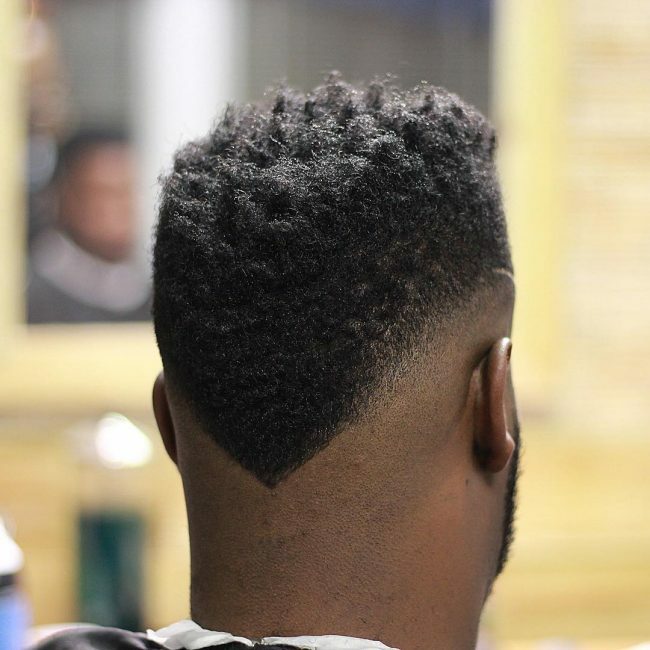 The V-shaped mohawk till the bottom of the back of the head gives this haircut a sensational look. The sides leading to the back are shaved with a clipper. The entire haircut is done courtesy of a clipper. 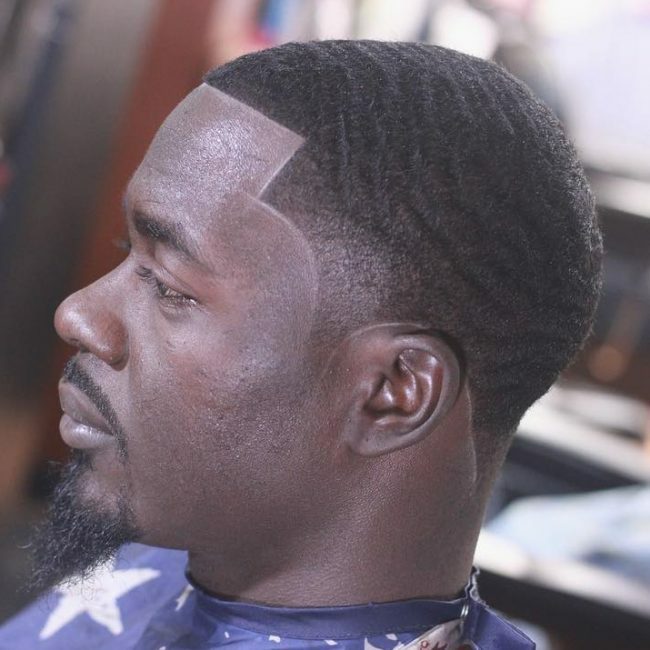 The upper part is cut short with help of blade 3 of the clipper while the sides and back are shaved with a combo of blade 1 and 2. 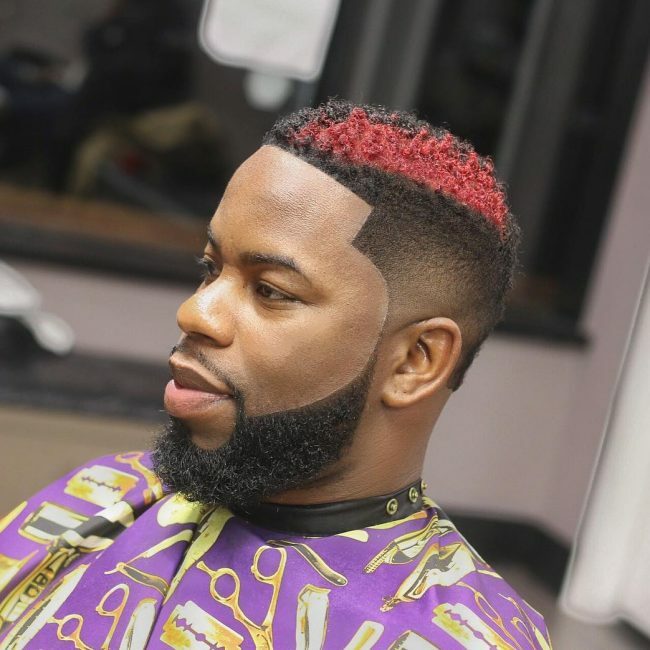 The top of the head hair is cut short to 1 cm length and split into original black and highlighted red. 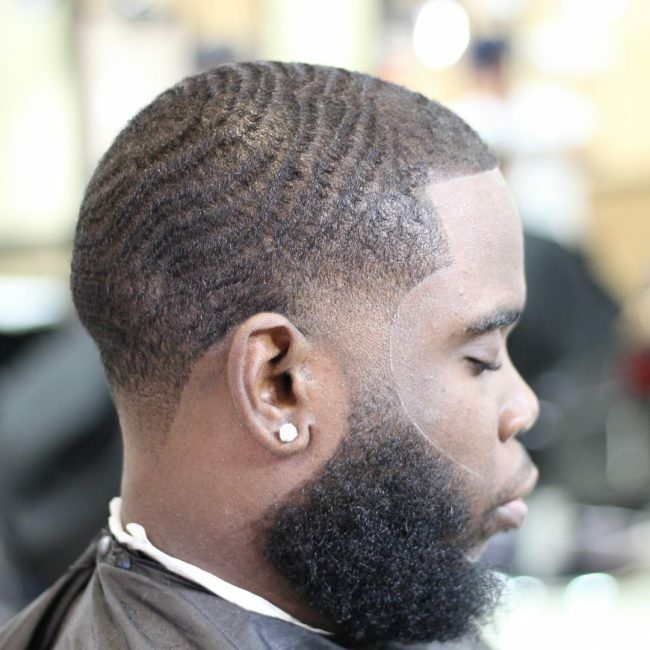 The sides have a thick slope with the whisker joining part shaved to skin length. In this Native American-style, the top of the head has braided together in a zigzag way down and secured with a tie. The rest of the rest which includes the sides and the back are shaved to the basic skin length. 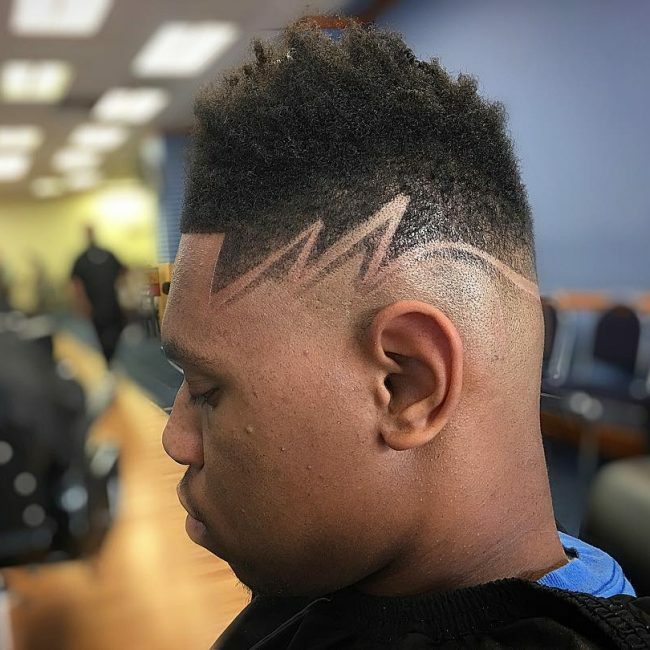 The top of the head hair are brought up in a spiked style while the sides and back are not greatly faded, the back has a blade signature marked. 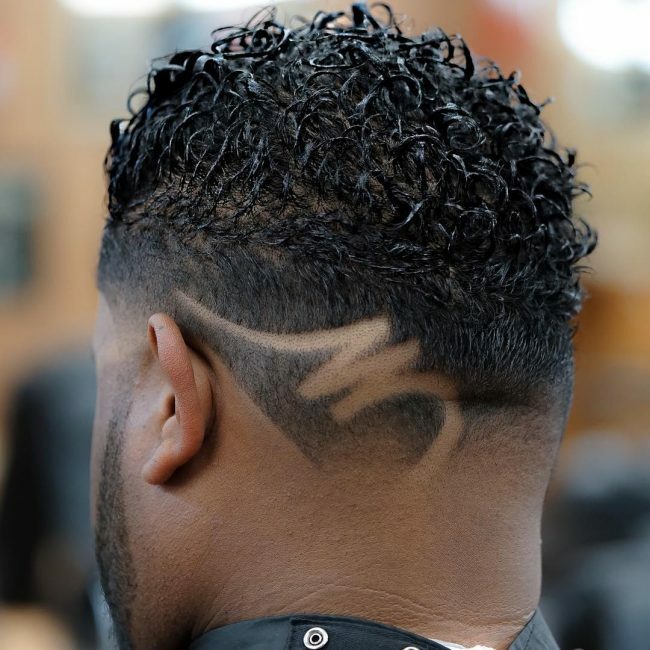 The work of the barber is very stylish. 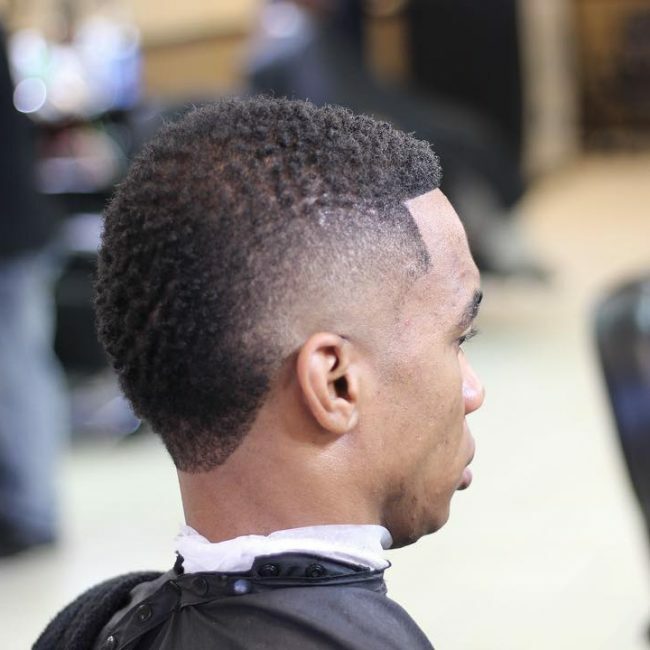 The sharp edges of the haircut are very visible along with the faded sides and back. The top of the head has curls spiked up with gel to give an overall amazing look. The top along with the back is cut with scissors and left with double layer thickness. 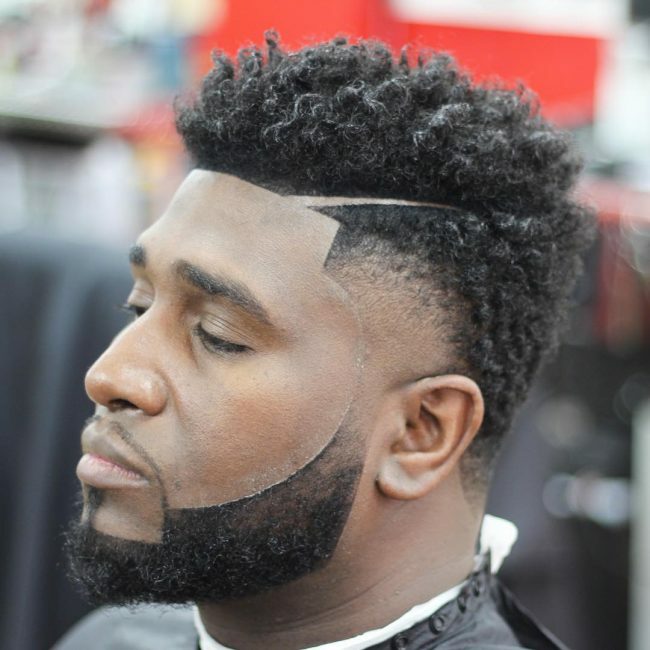 The temples are shaved and the beard is thick with the inverted fade. The top of the head has all the curls intact as they are only cut short with scissors. The sides are much lighter than the back of the head with both not having any curls. The center of the back of the head is joining the top of the head with curls left and no clipper work. 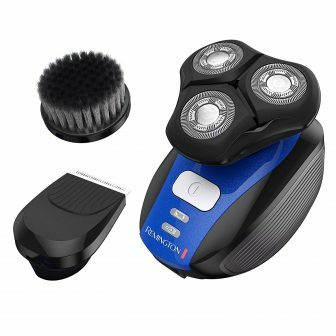 The the back of the head is shaved using blade 1 of a clipper. 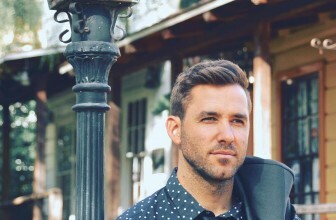 The hair is left from the front to the back in a V-neck style. The top has more hair than the V-neck but the sides of the V and the head is completely shaved. The hedge hawk style is impressively done with the curls spiked up. 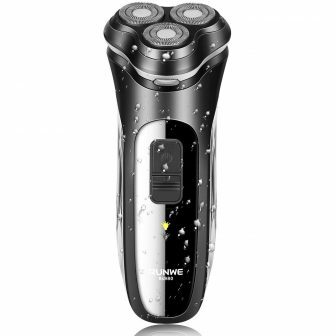 The rest of the head is shaved to a bare minimum using a trimmer. 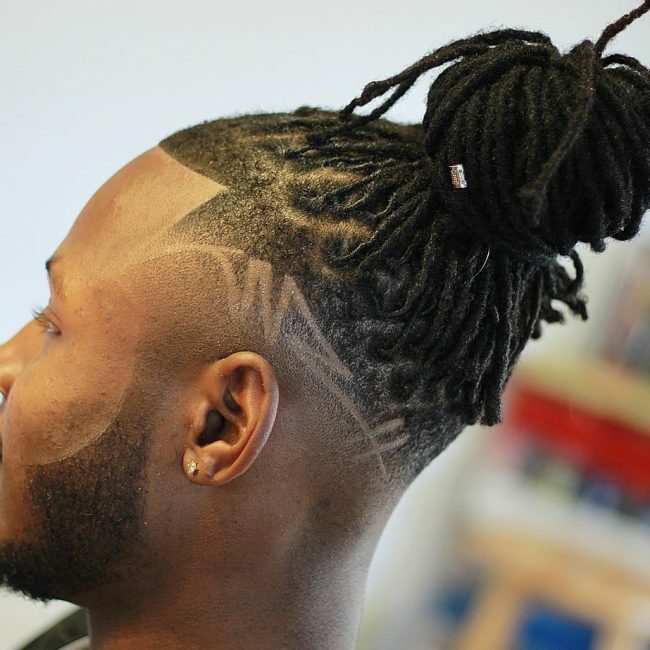 It’s definitely the Bob Marley style where the dreads are tied to a knot and elegantly put to one side. 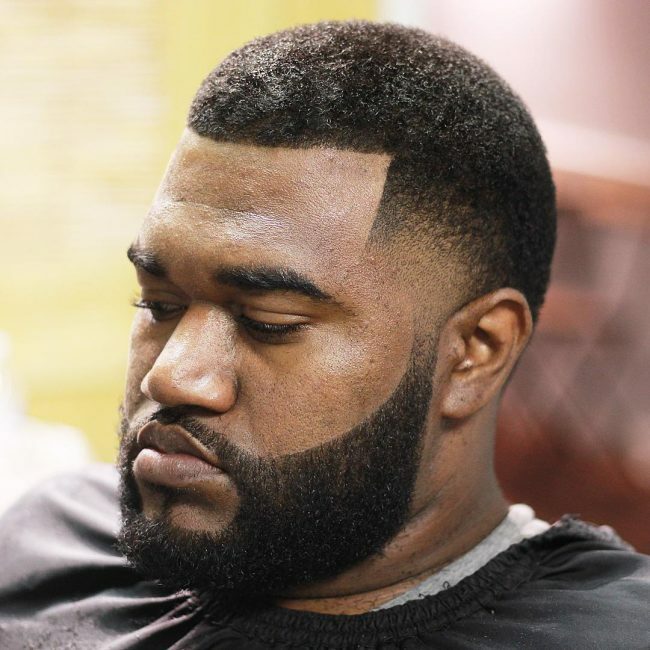 The slope and front of the head have more hair than the sides and back. 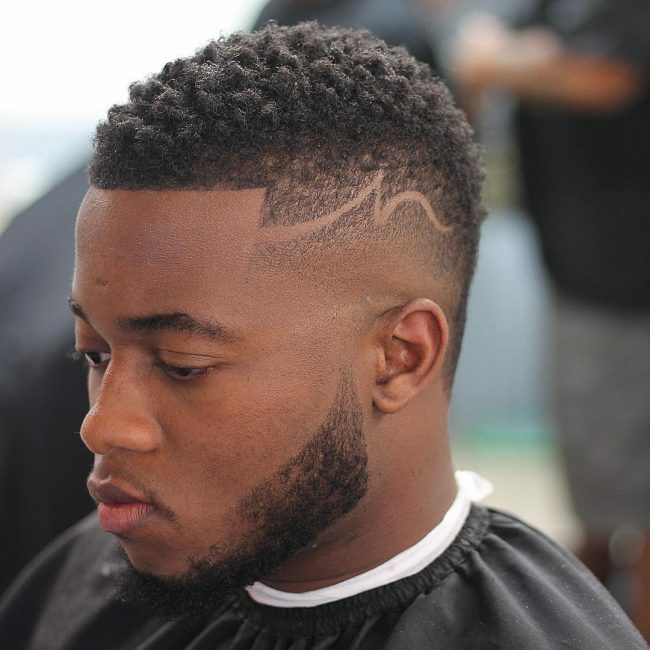 The sides also have fashionable blade work done. 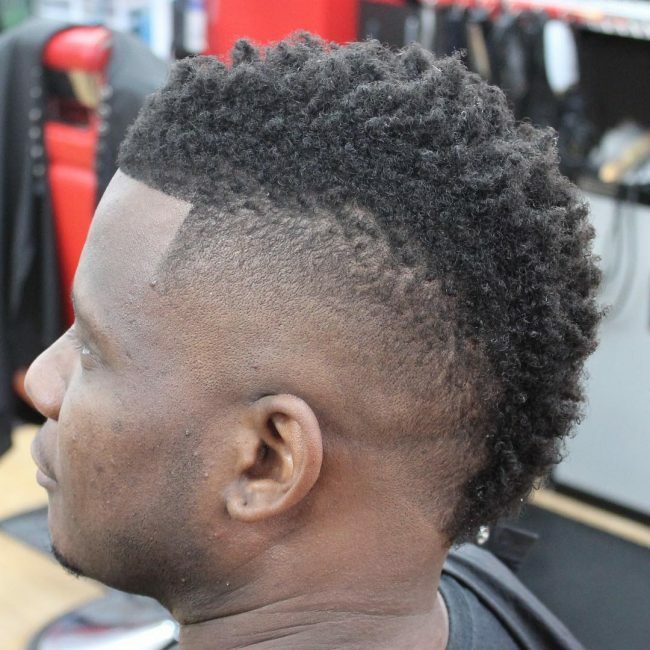 This mohawk haircut has left all the hair with curls in the center of the entire head. 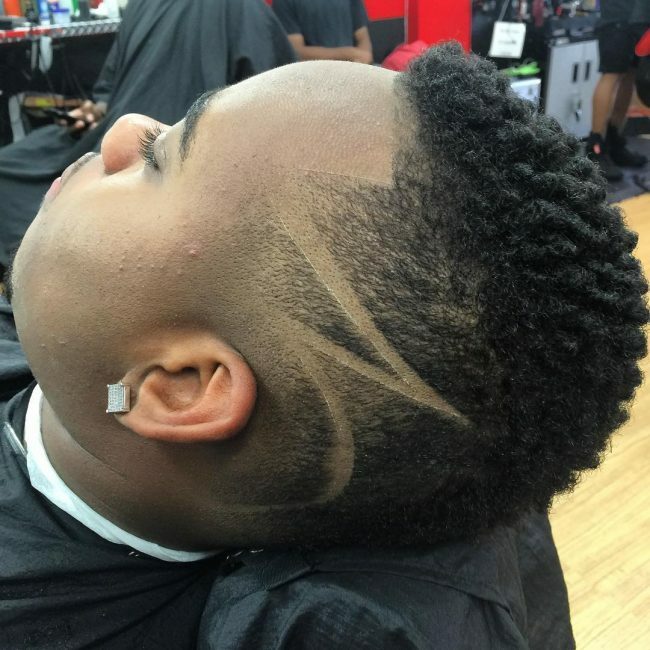 The sides have freestyle designing done with exquisite blade artistry. 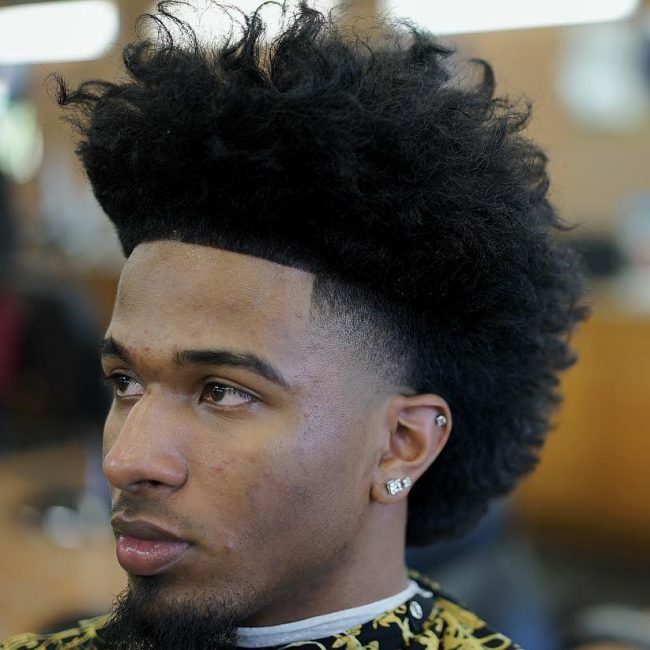 The hair on the top of the head is cut in a semi-circle position while the sides are faded in this 70s Afro look. The double blade work left side gives it a 21st-century vibe. 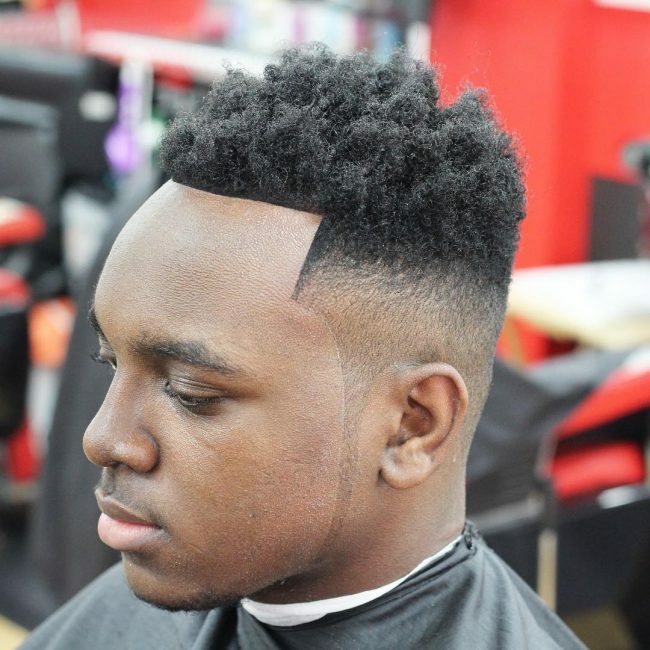 This ultra cool haircut has the top of the head cut into basic hair layer with the sides and back completely shaved. 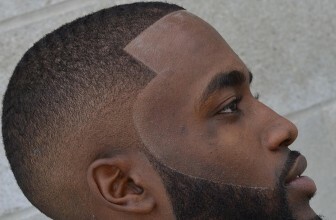 The borders of the head are made sleek with blade work. The top of the head is all the sponge curls while the slope is thicker than the sides and back. 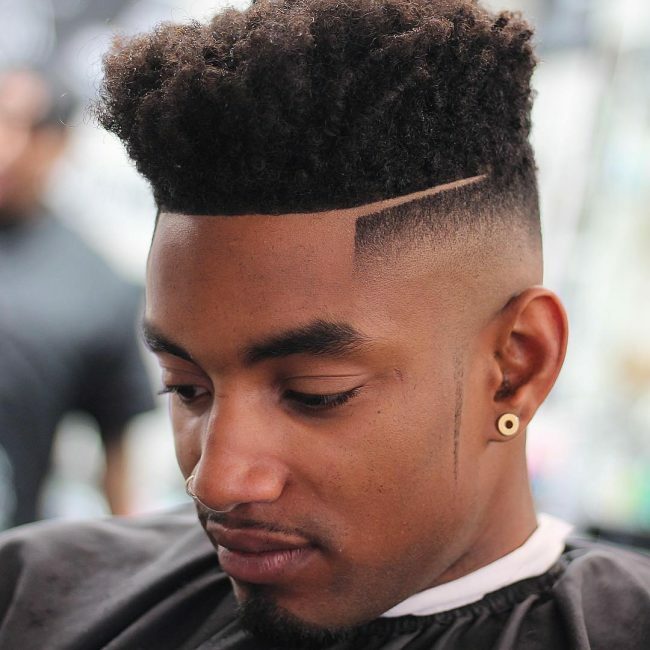 The zig-zag line separates the high top and sides and is made with a blade. 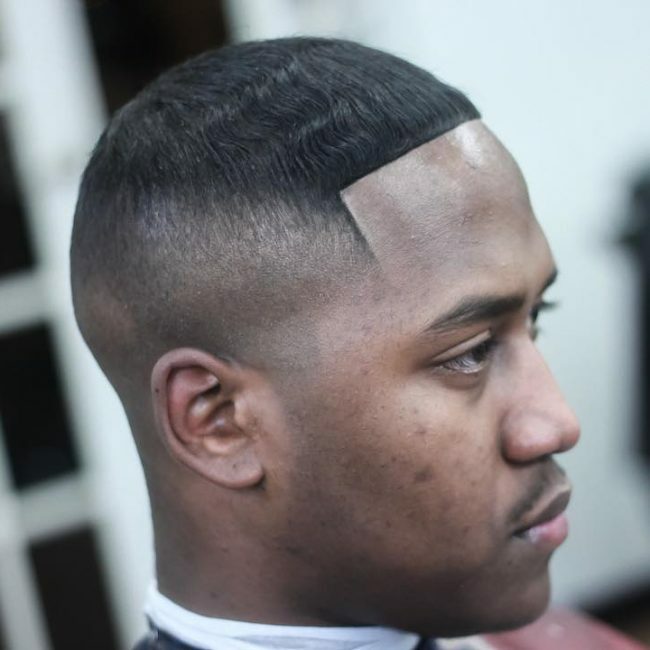 The top of the head has tiny layers done by the barber. The slopes are shaved but still thicker than the sides and back. 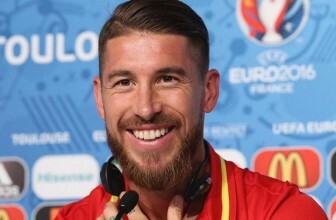 The side joins impressively with the whiskers and beards. 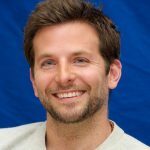 The haircut is split into two parts. The top has three braids that split the entire chunk of hair apart. 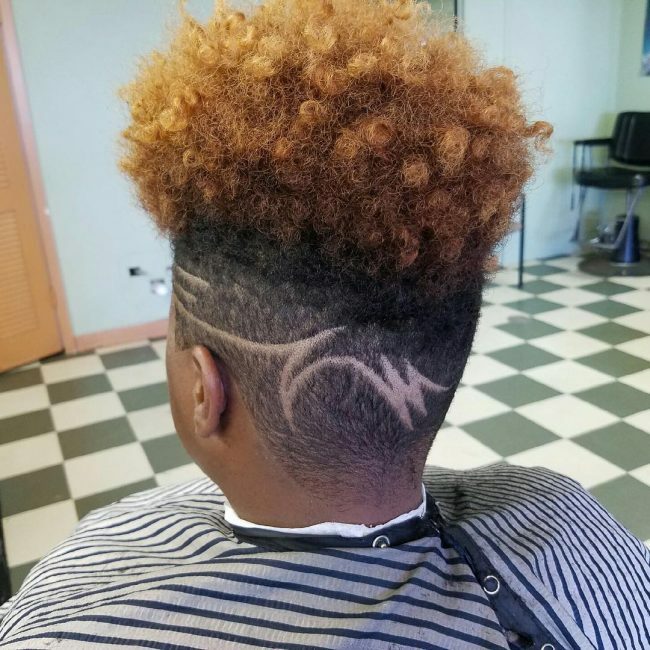 The sides are shaved with freestyle blade work. 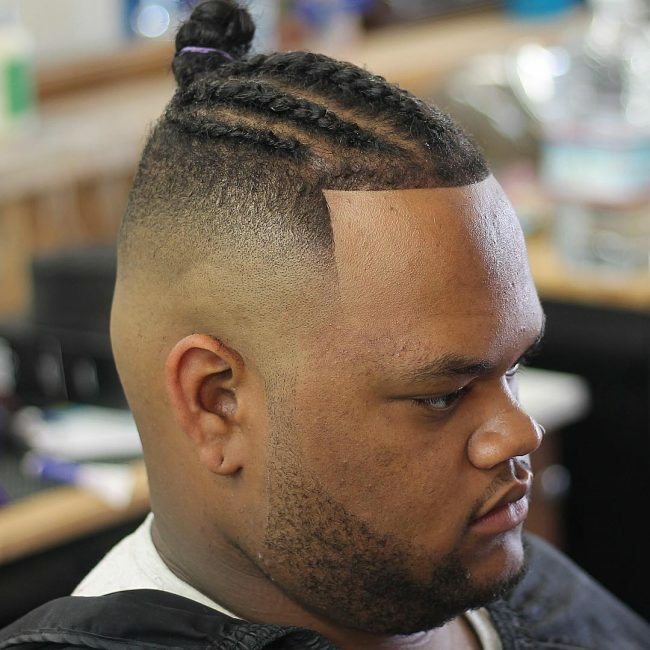 The entire head in the hairstyle is cut to the basic hair length with a shaped up front. The sides and back have top quality blade work done for designing. This vintage style brings back memories of the 20th century. The head is cut in a tall box style with the sides and back completely shaved with the skin being visible. 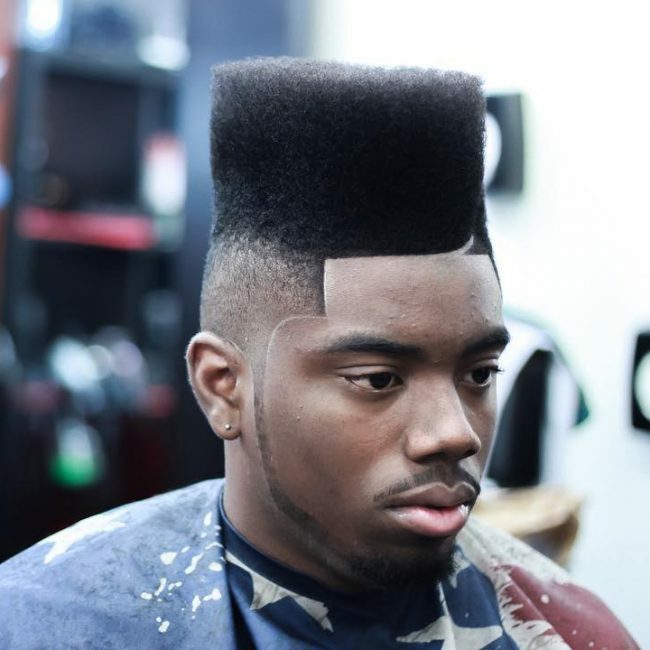 This retro haircut has the top hair spiked up to one block. The sides are separated with the top through steep blade line. 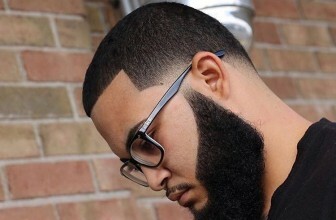 The slopes and sides ate shaved using a clipper. 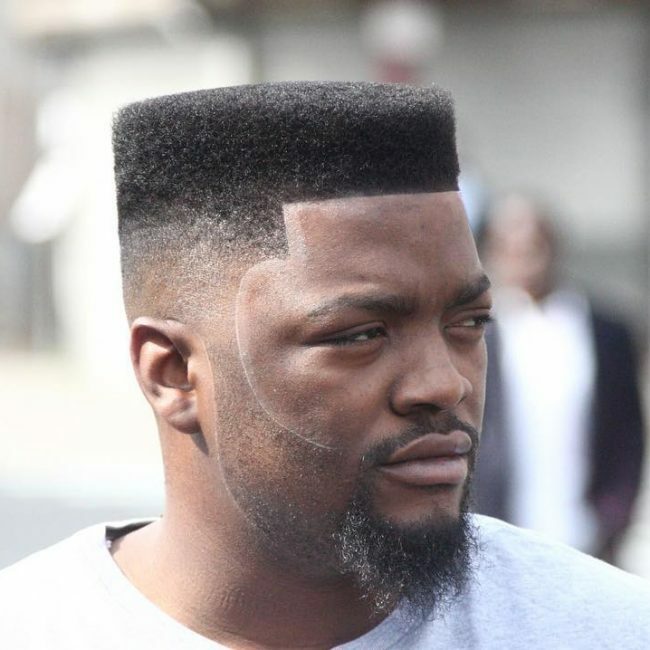 This fresh haircut has the entire center of the head cut down to one layer. The sides are shaved to the minimum length with the head skin being evident. The main hair on the top are split into 5 braids and the length of them is held together in a knot. The sides have slopes which are slightly thicker than the lower sides and back. The entire head has faded look. 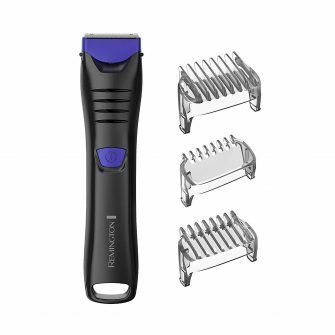 The sides are shaved to minimum length using blade 1 of a clipper. The top is gold highlighted with beads on either side on the top of the head. 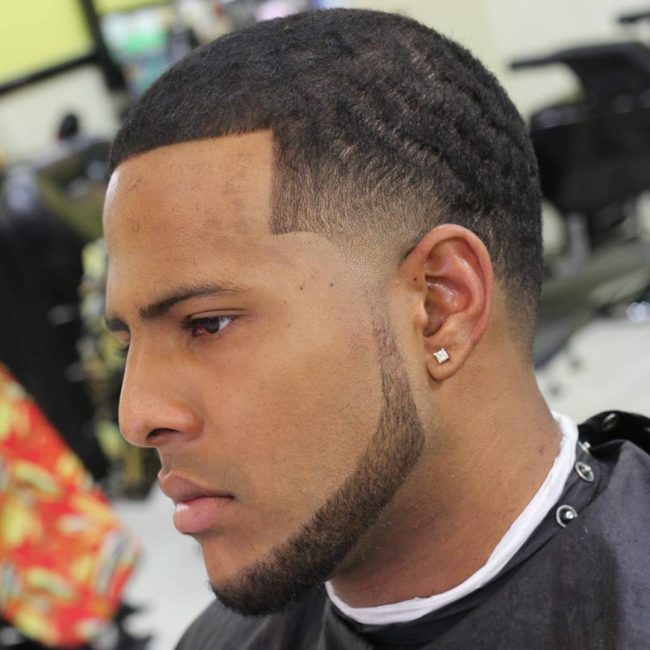 The haircut has the top with curls left to two cm’s length while the sides and back are shaved to a great extent. the side also has blade design evident. 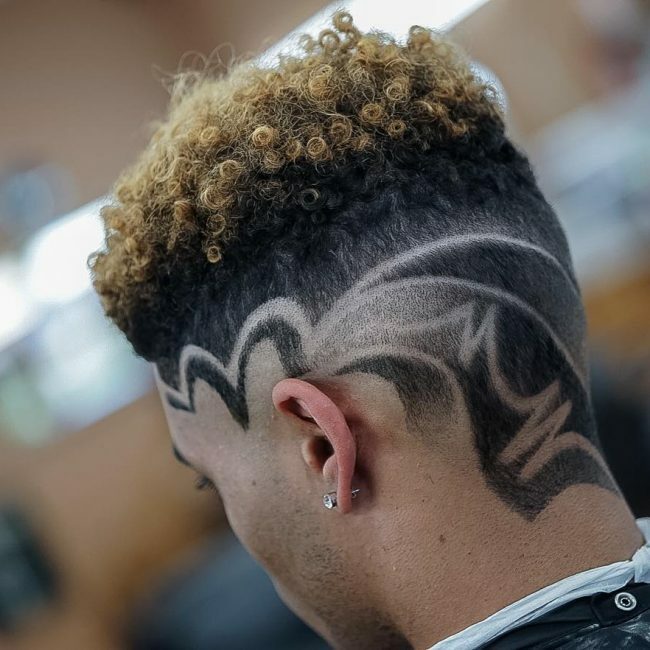 The curly hair on the top and back is cut in a mohawk style. 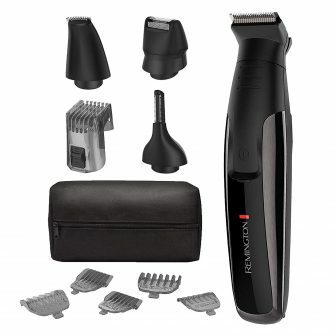 The sides are shaved to the bare minimum length with a steep blade design done. 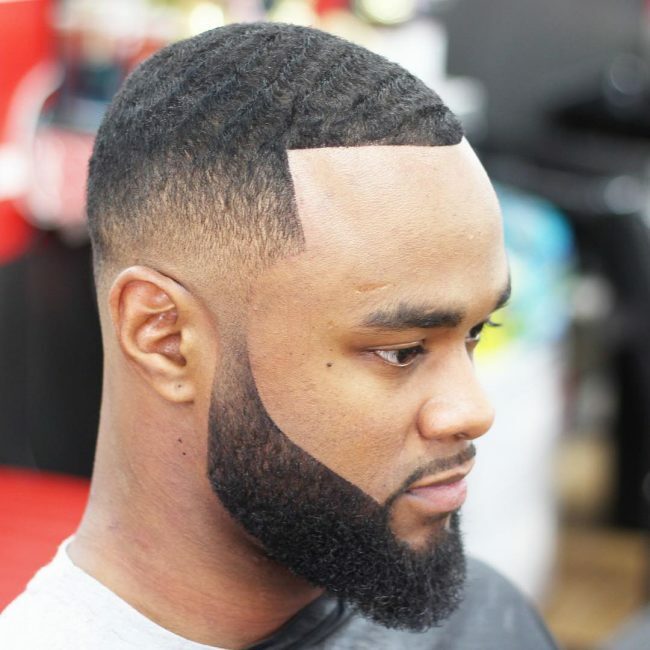 The top of the head has double hair thickness with the slope being shaved but still slightly heavier than the lower side. 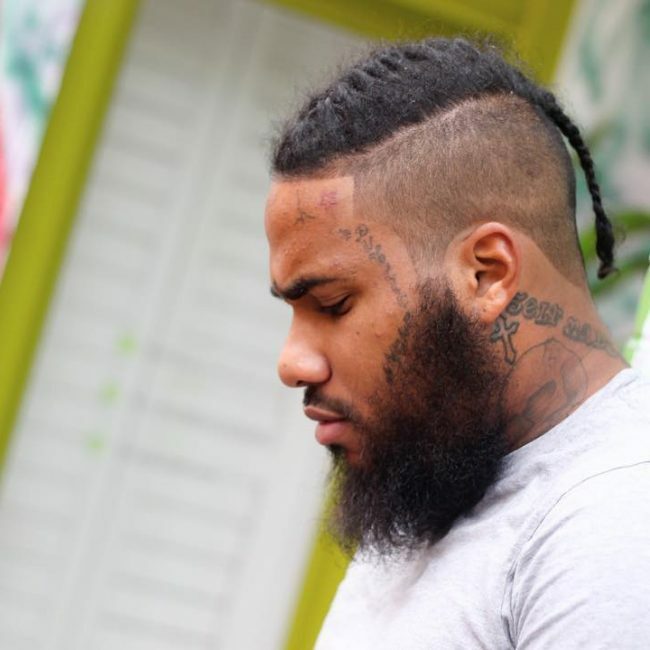 The front has a nice shape up. The head has twisted curls spiked up impressively right till the back of the head. The lower sides of the head are completely shaved with skin being evident. 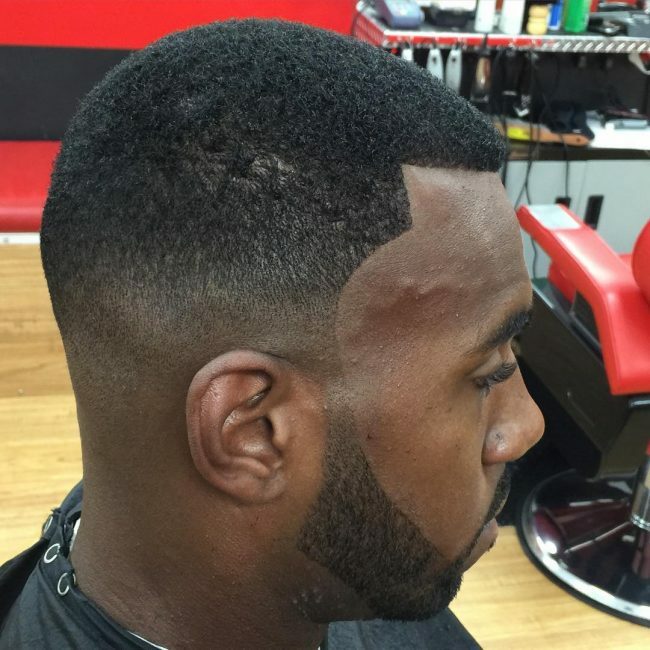 Here was the list of the best fade haircuts for black men. It will give a fresh new cool for whoever plans to get them. They are classy and very elegant at the same time.